این نوشتار نیازمند آمار و ارقام دقیق است. با افزودن آمار برطبق اصول اثبات‌پذیری و شیوه ارجاع به منابع، . دریای جنوبی چین دریایی حاشیه‌ای است که بخشی از اقیانوس آرام به‌شمار می‌آید و ناحیه‌ای در حدود ۳ و نیم میلیون کیلومتر مربع از سنگاپور تا تنگهٔ تایوان را دربر می‌گیرد. پس از پنج اقیانوس جهان این دریا بزرگ‌ترین ناحیهٔ دریایی جهان است. جزیره‌های واقع بر دریای جنوبی چین که با هم یک مجمع‌الجزایر را تشکیل می‌دهند بالغ بر صدها عدد هستند. این جزیره‌ها که عمدتاً خالی از سکنه هستند و همچنین خود دریا مورد جدال کشورهای مختلف بوده‌اند. به همین علت حتی نام‌های متفاوتی برای اشاره به این دریا به کار می‌رود که البته «دریای جنوبی چین» نام پذیرفته شدهٔ بین‌المللی، حداقل در انگلیسی و زبان‌های اروپایی است. ویتنامی‌ها بعضاً این دریا را «دریای شرق» می‌نامند و در فیلیپین بعضاً از اصطلاح «دریای لوزون» (اشاره به جزیرهٔ لوزون در کشور فیلیپین) استفاده می‌شود. جمهوری خلق چین تقریباً بر کل دریا و کشورهای ویتنام، فیلیپین، مالزی، برونئی و تایوان هریک بر بخش‌هایی از آن ادعای مالکیت دارند. همچنین این کشورها بر سر جزایر غنی از نفت و گاز اسپراتلی و پارسل اختلاف دارند. ایالات متحده این دریا را از آب‌های بین‌المللی می‌داند و بر حق قانونی کشتی‌ها و زیردریایی‌هایش در رفت‌وآمد در این دریا تأکید می‌ورزد. "West Philippine Sea" redirects here. For the western part of the Philippine Sea (lying east of the Philippines), see Philippine Sea. The South China Sea is a marginal sea that is part of the Pacific Ocean, encompassing an area from the Karimata and Malacca Straits to the Strait of Taiwan of around 3,500,000 square kilometres (1,400,000 sq mi). The sea carries tremendous strategic importance; one-third of the world's shipping passes through it, carrying over $3 trillion in trade each year, it contains lucrative fisheries, which are crucial for the food security of millions in Southeast Asia. Huge oil and gas reserves are believed to lie beneath its seabed. north and northeast of Natuna Islands. South China Sea is the dominant term used in English for the sea, and the name in most European languages is equivalent. This name is a result of early European interest in the sea as a route from Europe and South Asia to the trading opportunities of China. In the sixteenth century Portuguese sailors called it the China Sea (Mare da China); later needs to differentiate it from nearby bodies of water led to calling it the South China Sea. 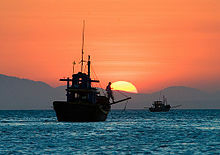 The International Hydrographic Organization refers to the sea as "South China Sea (Nan Hai)". The Yizhoushu, which was a chronicle of the Western Zhou dynasty (1046–771 BCE) gives the first Chinese name for the South China Sea as Nanfang Hai (Chinese: 南方海; pinyin: Nánfāng Hǎi; literally: 'Southern Sea'), claiming that barbarians from that sea gave tributes of hawksbill sea turtles to the Zhou rulers. The Classic of Poetry, Zuo Zhuan, and Guoyu classics of the Spring and Autumn period (771–476 BCE) also referred to the sea, but by the name Nan Hai (Chinese: 南海; pinyin: Nán Hǎi; literally: 'South Sea') in reference to the State of Chu's expeditions there. Nan Hai, the South Sea, was one of the Four Seas of Chinese literature. There are three other seas, one for each of the four cardinal directions. During the Eastern Han dynasty (23–220 CE), China's rulers called the Sea Zhang Hai (Chinese: 漲海; pinyin: Zhǎng Hǎi; literally: 'distended sea'). Fei Hai (Chinese: 沸海; pinyin: Fèi Hǎi; literally: 'boil sea') became popular during the Southern and Northern Dynasties period. Usage of the current Chinese name, Nan Hai (South Sea), became gradually widespread during the Qing Dynasty. In Southeast Asia it was once called the Champa Sea or Sea of Cham, after the maritime kingdom of Champa that flourished there before the sixteenth century. The majority of the sea came under Japanese naval control during World War II following the military acquisition of many surrounding South East Asian territories in 1941. Japan calls the sea Minami Shina Kai "South China Sea". This was written 南支那海 until 2004, when the Japanese Foreign Ministry and other departments switched the spelling to 南シナ海, which has become the standard usage in Japan. In China, it is called the "South Sea", 南海 Nánhǎi, and in Vietnam the "East Sea", Biển Đông. 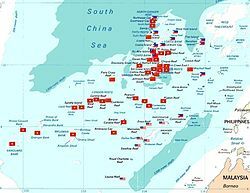 In Malaysia, Indonesia and the Philippines, it was long called the "South China Sea" (Dagat Timog Tsina in Tagalog, Laut China Selatan in Malay), with the part within Philippine territorial waters often called the "Luzon Sea", Dagat Luzon, by the Philippines. However, following an escalation of the Spratly Islands dispute in 2011, various Philippine government agencies started using the name "West Philippine Sea". A Philippine Atmospheric, Geophysical and Astronomical Services Administration (PAGASA) spokesperson said that the sea to the east of the Philippines will continue to be called the Philippine Sea. In September 2012, Philippine President Benigno Aquino III signed Administrative Order No. 29, mandating that all government agencies use the name "West Philippine Sea" to refer to the parts of the South China Sea within the Philippines' exclusive economic zone, including the Luzon Sea as well as the waters around, within and adjacent to the Kalayaan Island Group and Bajo de Masinloc, and tasked the National Mapping and Resource Information Authority (NAMRIA) to use the name in official maps. In July 2017, to assert its sovereignty, Indonesia renamed the northern reaches of its exclusive economic zone in the South China Sea as the "North Natuna Sea", which is located north of the Indonesian Natuna Islands, bordering the southern Vietnam exclusive economic zone, corresponding to the southern end of the South China Sea. The "Natuna Sea" is located south of Natuna Island within Indonesian territorial waters. Therefore, Indonesia has named two seas that are portions of the South China Sea; the Natuna Sea located between Natuna Islands and the Lingga and Tambelan Archipelagos, and the North Natuna Sea located between the Natuna Islands and Cape Cà Mau on the southern tip of the Mekong Delta in Vietnam. States and territories with borders on the sea (clockwise from north) include: the People's Republic of China, Republic of China (Taiwan), the Philippines, Malaysia, Brunei, Indonesia, Singapore, and Vietnam. Major rivers that flow into the South China Sea include the Pearl, Min, Jiulong, Red, Mekong, Rajang, Pahang, Pampanga, and Pasig Rivers. On the South. The Eastern and Southern limits of Singapore and Malacca Straits [A line joining Tanjong Datok, the Southeast point of Johore (1°22′N 104°17′E﻿ / ﻿1.367°N 104.283°E﻿ / 1.367; 104.283) through Horsburgh Reef to Pulo Koko, the Northeastern extreme of Bintan Island (1°13.5′N 104°35′E﻿ / ﻿1.2250°N 104.583°E﻿ / 1.2250; 104.583). The Northeastern coast of Sumatra] as far West as Tanjong Kedabu (1°06′N 102°58′E﻿ / ﻿1.100°N 102.967°E﻿ / 1.100; 102.967) down the East coast of Sumatra to Lucipara Point (3°14′S 106°05′E﻿ / ﻿3.233°S 106.083°E﻿ / -3.233; 106.083) thence to Tanjong Nanka, the Southwest extremity of Banka Island, through this island to Tanjong Berikat the Eastern point (2°34′S 106°51′E﻿ / ﻿2.567°S 106.850°E﻿ / -2.567; 106.850), on to Tanjong Djemang (2°36′S 107°37′E﻿ / ﻿2.600°S 107.617°E﻿ / -2.600; 107.617) in Billiton, along the North coast of this island to Tanjong Boeroeng Mandi (2°46′S 108°16′E﻿ / ﻿2.767°S 108.267°E﻿ / -2.767; 108.267) and thence a line to Tanjong Sambar (3°00′S 110°19′E﻿ / ﻿3.000°S 110.317°E﻿ / -3.000; 110.317) the Southwest extreme of Borneo. On the East. From Tanjong Sambar through the West coast of Borneo to Tanjong Sampanmangio, the North point, thence a line to West points of Balabac and Secam Reefs, on to the West point of Bancalan Island and to Cape Buliluyan, the Southwest point of Palawan, through this island to Cabuli Point, the Northern point thereof, thence to the Northwest point of Busuanga and to Cape Calavite in the island of Mindoro, to the Northwest point of Lubang Island and to Point Fuego (14°08'N) in Luzon Island, through this island to Cape Engano, the Northeast point of Luzon, along a line joining this cape with the East point of Balintang Island (20°N) and to the East point of Y'Ami Island (21°05'N) thence to Garan Bi, the Southern point of Taiwan (Formosa), through this island to Santyo (25°N) its North Eastern Point. On the North. From Fuki Kaku the North point of Formosa to Kiushan Tao (Turnabout Island) on to the South point of Haitan Tao (25°25'N) and thence Westward on the parallel of 25°24' North to the coast of Fukien. On the West. The Mainland, the Southern limit of the Gulf of Thailand and the East coast of the Malay Peninsula. However, in a revised edition of Limits of Oceans and Seas, 4th edition (1986), the International Hydrographic Organization officially recognized the Natuna Sea. Thus the southern limit of South China Sea is revised from the Bangka Belitung Islands to the Natuna Islands. The sea lies above a drowned continental shelf; during recent ice ages global sea level was hundreds of metres lower, and Borneo was part of the Asian mainland. The South China Sea opened around 45 million years ago when the "Dangerous Ground" rifted away from southern China. Extension culminated in seafloor spreading around 30 million years ago, a process that propagated to the SW resulting in the V-shaped basin we see today. Extension ceased around 17 million years ago. Arguments have continued about the role of tectonic extrusion in forming the basin. Paul Tapponnier and colleagues have argued that as India collides with Asia it pushes Indochina to the SE. The relative shear between Indochina and China caused the South China Sea to open. This view is disputed by geologists[who?] who do not consider Indochina to have moved far relative to mainland Asia. Marine geophysical studies in the Gulf of Tonkin by Peter Clift has shown that the Red River Fault was active and causing basin formation at least by 37 million years ago in the NW South China Sea, consistent with extrusion playing a part in the formation of the sea. Since opening the South China Sea has been the repository of large sediment volumes delivered by the Mekong River, Red River and Pearl River. Several of these deltas are rich in oil and gas deposits. The Spratly Islands spread over an 810 by 900 km area covering some 175 identified insular features, the largest being Taiping Island (Itu Aba) at just over 1.3 km long and with its highest elevation at 3.8 metres. The largest singular feature in the area of the Spratly Islands is a 100 km wide seamount called Reed Tablemount, also known as Reed Bank, in the northeast of the group, separated from Palawan Island of the Philippines by the Palawan Trench. Now completely submerged, with a depth of 20 m, it was an island until it sank about 7,000 years ago due to the increasing sea level after the last ice age. With an area of 8,866 km², it is one of the largest submerged atoll structures in the world. The South China Sea is an extremely significant body of water in a geopolitical sense. It is the second most used sea lane in the world, while in terms of world annual merchant fleet tonnage, over 50% passes through the Strait of Malacca, the Sunda Strait, and the Lombok Strait. Over 1.6 million m³ (10 million barrels) of crude oil a day are shipped through the Strait of Malacca, where there are regular reports of piracy, but much less frequently than before the mid-20th century. The region has proven oil reserves of around 1.2 km³ (7.7 billion barrels), with an estimate of 4.5 km³ (28 billion barrels) in total. Natural gas reserves are estimated to total around 7,500 km³ (266 trillion cubic feet). A 2013 report by the U.S. Energy Information Administration raised the total estimated oil reserves to 11 billion barrels. In 2014 China began to drill for oil in waters disputed with Vietnam. According to studies made by the Department of Environment and Natural Resources, Philippines, this body of water holds one third of the entire world's marine biodiversity, thereby making it a very important area for the ecosystem. However the fish stocks in the area are depleted, and countries are using fishing bans as a means of asserting their sovereignty claims. Indonesia's maritime waters have been breached by fishing fleets from Vietnam and the Philippines leading to said ships being seized and sunk by Indonesian authorities. China announced in May 2017 a breakthrough for mining methane clathrates, when they extracted methane from hydrates in the South China Sea. The Philippines, China, and Taiwan over Scarborough Shoal. Vietnam, China, and Taiwan over waters west of the Spratly Islands. Some or all of the islands themselves are also disputed between Vietnam, China, Taiwan, Brunei, Malaysia, and the Philippines. The Paracel Islands are disputed between the China, Taiwan and Vietnam. China and Vietnam have both been vigorous in prosecuting their claims. China (various governments) and South Vietnam each controlled part of the Paracel Islands before 1974. A brief conflict in 1974 resulted in 18 Chinese and 53 Vietnamese deaths, and China has controlled the whole of Paracel since then. The Spratly Islands have been the site of a naval clash, in which over 70 Vietnamese sailors were killed just south of Chigua Reef in March 1988. Disputing claimants regularly report clashes between naval vessels. ASEAN in general, and Malaysia in particular, have been keen to ensure that the territorial disputes within the South China Sea do not escalate into armed conflict. As such, Joint Development Authorities have been set up in areas of overlapping claims to jointly develop the area and divide the profits equally without settling the issue of sovereignty over the area. This is true particularly in the Gulf of Thailand. Generally, China has preferred to resolve competing claims bilaterally, while some ASEAN countries prefer multilateral talks, believing that they are disadvantaged in bilateral negotiations with the much larger China and that because many countries claim the same territory only multilateral talks could effectively resolve the competing claims. The overlapping claims over Pedra Branca or Pulau Batu Putih including the neighboring Middle Rocks by both Singapore and Malaysia were settled in 2008 by the International Court of Justice, awarding Pedra Branca/Pulau Batu Puteh to Singapore and the Middle Rocks to Malaysia. In July 2010, US Secretary of State Hillary Clinton called for China to resolve the territorial dispute. China responded by demanding the US keep out of the issue. This came at a time when both countries had been engaging in naval exercises in a show of force to the opposing side, which increased tensions in the region. The US Department of Defense released a statement on August 18 where it opposed the use of force to resolve the dispute, and accused China of assertive behaviour. On July 22, 2011, one of India's amphibious assault vessels, the INS Airavat which was on a friendly visit to Vietnam, was reportedly contacted at a distance of 45 nautical miles from the Vietnamese coast in the disputed South China Sea on an open radio channel by a vessel identifying itself as the Chinese Navy and stating that the ship was entering Chinese waters. The spokesperson for the Indian Navy clarified that as no ship or aircraft was visible from INS Airavat it proceeded on her onward journey as scheduled. The Indian Navy further clarified that "[t]here was no confrontation involving the INS Airavat. India supports freedom of navigation in international waters, including in the South China Sea, and the right of passage in accordance with accepted principles of international law. These principles should be respected by all." In September 2011, shortly after China and Vietnam had signed an agreement seeking to contain a dispute over the South China Sea, India's state-run explorer, Oil and Natural Gas Corporation (ONGC) said that its overseas investment arm ONGC Videsh Limited had signed a three-year deal with PetroVietnam for developing long-term cooperation in the oil sector and that it had accepted Vietnam's offer of exploration in certain specified blocks in the South China Sea. In response, Chinese Foreign Ministry spokesperson Jiang Yu issued a protest. The spokesman of the Ministry of External Affairs of the Government of India responded by saying that “The Chinese had concerns but we are going by what the Vietnamese authorities have told us and have conveyed this to the Chinese.” The Indo-Vietnamese deal was also denounced by the Chinese state-run newspaper Global Times. In 1999, Taiwan claimed the entirety of the South China Sea islands under the Lee Teng-hui administration. The entire subsoil, seabed and waters of the Paracels and Spratlys are claimed by Taiwan. In 2012 and 2013, Vietnam and Taiwan butted heads against each other over anti-Vietnamese military exercises by Taiwan. In May 2014, China established an oil rig near the Paracel Islands, leading to multiple incidents between Vietnamese and Chinese ships. In 2017, analysts expect the US, under Donald Trump's administration, to take a more aggressive stance against China in the South China Sea. In January 2013, the Philippines formally initiated arbitration proceedings against China's claim on the territories within the "Nine-Dash Line" that includes the Spratly Islands, which it said is unlawful under the United Nations Convention on the Law of the Sea (UNCLOS). On July 12, 2016, the arbitral tribunal backed the Philippines, saying that there was no evidence that China had historically exercised exclusive control over the waters or resources, hence there was "no legal basis for China to claim historic rights" over the nine-dash line. The tribunal also criticized China's land reclamation projects and its construction of artificial islands in the Spratly Islands, saying that it had caused "severe harm to the coral reef environment". It also characterized Taiping Island and other features of the Spratly Islands as "rocks" under UNCLOS, and therefore are not entitled to a 200 nautical mile exclusive economic zone. China however rejected the ruling, calling it "ill-founded". Taiwan, which currently administers Taiping Island, the largest of the Spratly Islands, also rejected the ruling. ^ Pacpaco, Ryan Ponce (2012). "Rename South China Sea -- solon | National". journal.com.ph. Archived from the original on 2011-06-10. Retrieved 29 September 2012. ^  ChinaPower, August 4, 2017. ^ A look at the top issues at Asian security meeting Associated Press, Robin McDowell, July 21, 2011. ^ a b c "Limits of Oceans and Seas, 3rd edition" (PDF). International Hydrographic Organization. 1953. § 49. Retrieved 7 February 2010. ^ "IHO PUBLICATION S-23, Limits of Oceans and Seas, Draft 4th Edition, 1986". IHO. ^ a b "Limits of Ocean and Seas" (PDF). International Hydrographic Organization. pp. 108–109. ^ a b c Shen, Jianming (2002). "China's Sovereignty over the South China Sea Islands: A Historical Perspective". Chinese Journal of International Law. 1 (1): 94–157. ^ Chang, Chun-shu (2007). The Rise of the Chinese Empire: Nation, State, and Imperialism in Early China, ca. 1600 B.C. – A.D. 8. University of Michigan Press. pp. 263–264. ISBN 978-0-472-11533-4. ^ Bray, Adam (June 18, 2014). "The Cham: Descendants of Ancient Rulers of South China Sea Watch Maritime Dispute From Sidelines - The ancestors of Vietnam's Cham people built one of the great empires of Southeast Asia". National Geographic. ^ "VN and China pledge to maintain peace and stability in East Sea". Socialist Republic of Vietnam Government Web Portal. ^ "FM Spokesperson on FIR control over East Sea". Embassy of Vietnam in USA. March 11, 2001. ^ "The Map of Vietnam". Socialist Republic of Vietnam Government Web Portal. Archived from the original on 2006-10-06. ^ John Zumerchik; Steven Laurence Danver (2010). Seas and Waterways of the World: An Encyclopedia of History, Uses, and Issues. ABC-CLIO. p. 259. ISBN 978-1-85109-711-1. ^ Quismundo, Tarra (2011-06-13). "South China Sea renamed in the Philippines". Philippine Daily Inquirer. Retrieved 2011-06-14. ^ "Administrative Order No. 29, s. 2012". Official Gazette. Government of the Philippines. September 5, 2012. ^ Prashanth Parameswaran (17 July 2017). "Why Did Indonesia Just Rename Its Part of the South China Sea?". The Diplomat. ^ Tom Allard; Bernadette Christina Munthe (14 July 2017). "Asserting sovereignty, Indonesia renames part of South China Sea". Reuters. ^ Jon Erickson; Ernest Hathaway Muller (2009). Rock Formations and Unusual Geologic Structures: Exploring the Earth's Surface. Infobase Publishing. p. 91. ISBN 978-1-4381-0970-1. ^ Johnson, Keith (5 May 2014). "How Do You Say 'Drill, Baby, Drill' in Chinese?". www.foreignpolicy.com. AFP - Getty. Retrieved 6 May 2014. ^ Schearf, Daniel. "S. China Sea Dispute Blamed Partly on Depleted Fish Stocks." VOA, May 16, 2012. Vietnam ‘Deeply Concerned’ by Indonesia’s War on Illegal Fishing Archived 2016-08-28 at the Wayback Machine, August 21, 2015, The Diplomat. Indonesia sinks Vietnam fishing boats, 5 Dec 2014. Indonesia sinks 34 of its neighbors' boats to celebrate Independence Day, and Vietnam isn't happy, August 21, 2015. Indonesia sinks 3 Vietnamese boats, December 15, 2014. ^ "China claims breakthrough in 'flammable ice'". 19 May 2017 – via www.bbc.com. ^ "China Taps Lode of 'Fire Ice' in South China Sea". ^ "Direct bilateral dialogue 'best way to solve disputes'". ^ Wong, Edward (February 5, 2010). "Vietnam Enlists Allies to Stave Off China's Reach". The New York Times. ^ a b "India-China face-off in South China Sea: Report". dna. 2 September 2011. ^ "South Asia Analysis Group". Archived from the original on 2012-03-30. ^ GatewayHouse (2015-06-11). "How India is Impacted by China's Assertiveness in the S. China Sea". Gateway House. Retrieved 2017-06-02. ^ a b Reuters Editorial (16 October 2011). "China paper warns India off Vietnam oil deal". Reuters India. ^ a b Ananth Krishnan. "China warns India on South China Sea exploration projects". The Hindu. ^ Taiwan sticks to its guns, to U.S. chagrin, July 14, 1999. ^ "Taiwan reiterates Paracel Islands sovereignty claim". Taipei Times. 11 May 2014. Retrieved 11 November 2016. ^ Photo: Taiwan military exercises with Vietnam as an imaginary enemy generals admit Taiping Island, September 5, 2012. Vietnam's angry at Taiwan as it stages live-fire drill in the Spratlys, 12 August 2012. Vietnam Demands Taiwan Cancel Spratly Island Live Fire, March 1, 2013. ^ "Q&A: South China Sea dispute". BBC News. ^ Bloomberg News (6 June 2014). "Vietnam Says China Still Ramming Boats, Airs Sinking Video". Bloomberg. Retrieved 6 June 2014. ^ Merez, Arianne (10 Mar 2017). "US expected to be 'more aggressive' in South China Sea: analyst". ABS-CBN News. Retrieved 11 Mar 2017. ^ "Timeline: South China Sea dispute". Financial Times. 12 July 2016. ^ Beech, Hannah (11 July 2016). "China's Global Reputation Hinges on Upcoming South China Sea Court Decision". TIME. ^ "A UN-appointed tribunal dismisses China's claims in the South China Sea". The Economist. 12 July 2016. ^ Perlez, Jane (12 July 2016). "Beijing's South China Sea Claims Rejected by Hague Tribunal". The New York Times. ^ Chow, Jermyn (12 July 2016). "Taiwan rejects South China Sea ruling, says will deploy another navy vessel to Taiping". The Straits Times. Singapore Press Holdings Ltd. Co.
^ "South China Sea: Tribunal backs case against China brought by Philippines". BBC. 12 July 2016. UNEP (2007). Review of the Legal Aspects of Environmental Management in the South China Sea and Gulf of Thailand. UNEP/GEF/SCS Technical Publication No. 9. Wang, Gungwu (2003). The Nanhai Trade: Early Chinese Trade in the South China Sea. Marshall Cavendish International. ISBN 9789812102416. Wikimedia Commons has media related to South China Sea. Audio Radio communication between United States Navy Boeing P-8A Poseidon aircraft operating under international law and the Chinese Navy warnings. این صفحه آخرین‌بار در ‏۲۳ اوت ۲۰۱۸ ساعت ‏۱۶:۴۹ ویرایش شده‌است.